Through its latest ‘Worldwide Quarterly Mobile Phone Tracker’, IDC has revealed that the global smartphone market declined 6.3 percent during the final quarter of last year, with 403.5 million smartphones shipped around the world as opposed to 430.7 million units during the same period in 2016. The figures for the full year also showed a marginal decline of 0.1 percent, largely due to the massive slowdown in the Chinese and American smartphone markets. 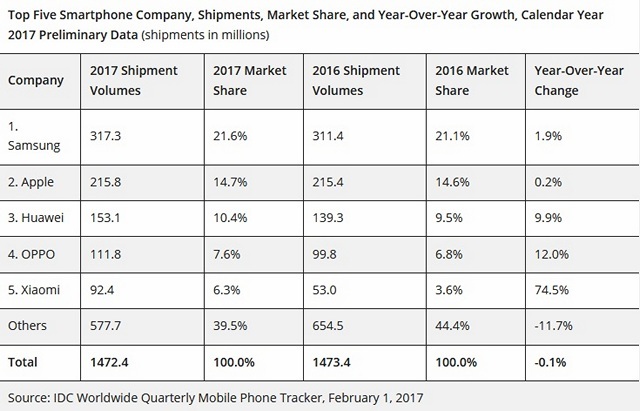 One of the major highlights of the report is Apple wresting the smartphone crown from Samsung after a long time, mostly because of the popularity of the iPhone X. However, the Cupertino-based tech giant also suffered lower sales during the final quarter. According to IDC, Apple’s total shipments of 77.3 million units during the final quarter of 2017 represent a 1.3 percent drop from the same period in 2016. However, that was still enough for the company to rise to the top, with the erstwhile number one, Samsung, managing to ship barely 74.1 million units in the fourth quarter, down 4.4 percent on a YoY basis. 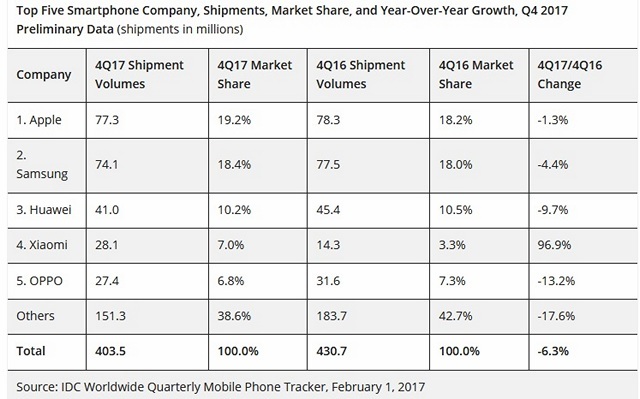 Samsung, however, retained its pole position as far as the full year is concerned, shipping 317.3 million units in all of 2017, up 1.9 percent from the 311.4 million units shipped in 2016. Apple also increased its yearly sales in 2017, albeit, only marginally, by 0.2%, shipping 215.8 million units as compared to 215.4 million units the previous year. Interestingly, while all the major smartphone vendors floundered during the final three months of last year, Xiaomi had a stellar quarter, managing to increase shipments by a whopping 96.9 percent during Q4 and 75.4 percent during all of 2017, largely on account of its tremendous success in India. The company shipped 28.1 million units during the last quarter and 92.4 million in the whole year, thereby sneaking into the top-five after a long while. Huawei and Oppo came in at numbers three and four with shipments of 153.1 and 111.8 million units respectively.